Based on the Scottish coast, The Scandinavian Shop has been trading for over 40 years, quickly becoming an essential part of the local community. 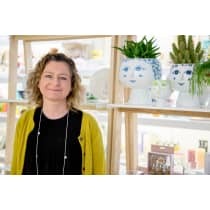 Taken over by owner Lucy Paterson in 2009, it has continued to be a destination for the best in Danish design, offering a collection of gift, homewares and accessories. With Lucy's wealth of experience in collecting beautiful items from her travels, this boutique is a treasure trove of unique and stylish pieces sourced from Scandinavia. "Years of travelling in exotic places had turned me into a bit of a collector of interesting finds, people were always telling me I should open a shop. As well as my travels, I find real inspiration in good design that stands the test of time."